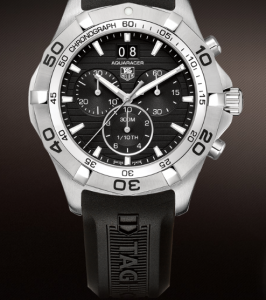 TAG’s Aquaracer’s are know for their quality and durability. The Aquaracer Grande Date, Chronograph, 43MM is a great example of this quality. This watch promises high accuracy, quality design, and durability, all in a well known classic design. This TAG has a black dial with date and Chronograph displays. The dial has horizontal lines and three Chronograph displays. The hands are luminescent white and steel; same as the time markers. The hour numerals are large and easily legible. In addition there are minute numerals, and second ticks so you can easily see what time it is at a glance. The strap is thick quality rubber. The rubber is sure to look good, and last, but if you want a similar look with a metal bracelet you may want to look at some of the other Aquaracers. Overall, the watch has a black and white theme that looks fantastic against the steel case and black bracelet. With the Chronograph and date displays this watch’s dial is packed. That is not to say that anything looks out of place, or that the watch is too busy. Quite the opposite. Looking at this watch you get the feel that everything is placed to ensure complex features, with an elegant design. Everything is placed perfectly to give a timeless, neat design. This watch is tough, with 300 meters of water resistance, and scratch resistant sapphire glass. In addition it provides excellent accuracy, being able to measure 12 hours within 1/10 of a seconds accuracy. The price of this watch online is around $1,500. This is not too costly for Aquaracers especially considering that this watch has the Chronograph feature. You will pay a bit extra for this watch’s Chronograph feature, but this isn’t a bad thing. The multiple dials give it a complex classic look, and they allow you to measure time with precision. If you like the look and feel of this watch, but don’t think that the Chronograph feature is worth it you may want to check out some other models. The Aquaracer WAF1110.FT8009, for example, has many of the same features, and a similar look, but without the Chronograph feature, and it costs about 400 to 500 dollars less. Overall if the Chronograph feature is a must then this is a great buy. You can be sure that this watch will provide you with excellent accuracy, durability, and a timeless look that will look great either dress-up, or in casual attire.